There is no denying to the the fact that more the population density, more the generation of waste, the plastic bottles and bags capture the major share of solid waste. A significant percentage of urban populations are facing housing shortage, which is becoming an acute issue in the modern age of development. It results in rising squatting and slum settlements. From ages, the traditional construction materials are used; such as bricks, concrete, fly ash bricks, hollow bricks, tiles, and other conventional materials without knowing the fact that it could hamper our eco-system. During the extraction of raw materials from nature, there is a subsequent cause of environmental degradation and depletion of natural resources is now become a global concern. A time has come to promote other eco-friendly yet stronger and durable materials that can be cost-efficient and easily available as well. The waste of billions of plastic PET water and beverage bottles are thrown away every year worldwide. In the US alone, 2,000,000 bottles are consumed every 15 minutes. After a recycling closer to 6%, remaining bottles are considered waste and have to be disposed in dumps, while a major percentage goes to polluting landscape, river and oceans. Now, Drinkabrick brings a solution for two problems – waste of plastic bottles and affordable housing for all. It is a new concrete construction system, where traditional concrete walls are built using plastic air bubble inside. The Drinkabrick aims to address the housing deficit, especially in the underdeveloped countries. Currently, the waste material as plastic PET bottles are not considered a construction system since it is not standard in shape, thus it cannot be calculated and therefore approved and insured by various counties. To implement this project, bottling companies only to change the shape of plastic bottles, just like a ‘Brick’. 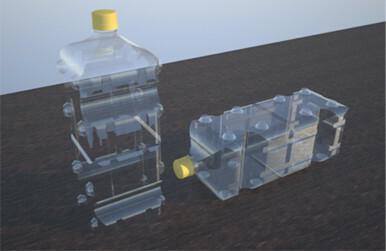 The standard shape of bottles makes easier for the system to be certified. The major resistance and structure take by the concrete, plastic only acts as an internal mould. The reinforcement can be done with steel bars similar to conventional bricks and concrete construction. Using plastic bottles, the wall becomes lighter, more economical and providing thermal, acoustic, and humidity insulations. Drinkabrick is ready to produce the first units for certification and they need your help to make this project successful. The campaign is currently live at Indiegogo for a goal of $50,000 and still 2 months left. The profit from the project will be reinvested in PET container technology and environmental protection innovation! The future will require the collaborative approach between various industries in order to take care of the immense amount of materials that are currently being produced without accessing the impact on the eco-system. Surely, the project will create a positive impact on the environment as well as housing deficit by providing an inexpensive building system on an almost free building material.